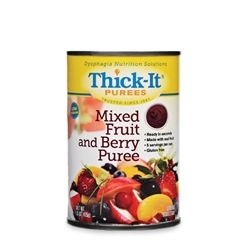 Served by itself, the mixed fruit and berry puree is a refreshing dessert made with real fruits like apples, peaches, strawberries, blueberries and cherries. For a richer dessert, combine with the Maple Cinnamon French Toast for a delicious fruit cobbler. Ingredients: Apples, peaches, water, sugar, strawberries, blueberries, cherries, cranberries, gellan gum, sodium citrate.